A Turkish Air Force F-16 fighter jet shot down a Russian Sukhoi Su-24M bomber aircraft near the Syria–Turkey border on 24 November 2015. 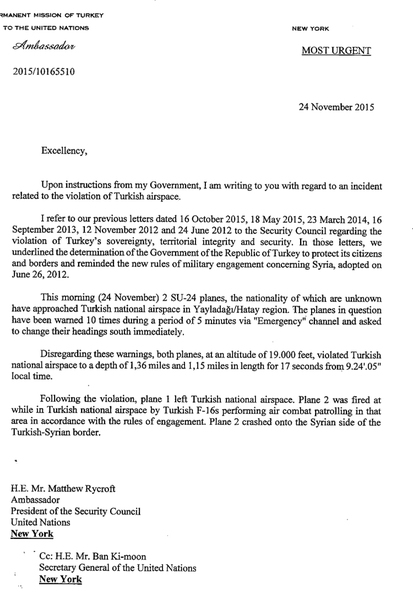 According to Turkey, the aircraft—whose nationality was unknown at the time—was fired upon while in Turkish airspace because it violated the border up to a depth of 2.19 kilometres (1.36 miles) for about 17 seconds after being warned to change its heading 10 times over a period of five minutes before entering the airspace. The Russia Defence Ministry denied the aircraft ever left Syrian airspace, counter-claiming that their satellite data showed that the Sukhoi was about 1,000 metres (1,100 yd) inside Syrian airspace when it was shot down. The US State Department said that the US independently confirmed that the aircraft's flight path violated Turkish territory, and that the Turks gave multiple warnings to the pilot, to which they received no response and released audio recordings of the warnings they had broadcast. Turkish President Recep Tayyip Erdogan pointed out that Turkey had the right to defend its airspace. Russian president Vladimir Putin said that the US knew the flight path of the Russian jet and should have informed Turkey; two US officials said that Russia did not inform the US military of its jet's flight plan. The shootdown was the first destruction of a Russian or Soviet Air Forces warplane by a NATO member state since the Korean War. Reactions to the incident included denunciation from Russia and an attempt to defuse the situation by NATO afterwards. Russia deployed the guided missile cruiser Moskva armed with S-300F (SA-N-6 Grumble) long-range SAM missiles off the Syrian coast near Latakia and S-400 (SA-21 Growler) mobile SAM systems to Khmeimim airbase. In response, the Turkish Armed Forces deployed a land-based Radar Electronic Support System (R-ESS) developed by Turkey's ASELSAN rendering the effective range of Russian SAM's out of reach of Turkey's airspace. The Turkish jammer systems also allegedly interfered with Russian aviation navigations, radars and military communications. After the 2012 shooting down of a Turkish jet by Syrian forces, Turkish Prime Minister Erdoğan protested, saying that brief incursions should not trigger an attack, pointing out that Turkey did not shoot down Syrian helicopters that strayed into Turkish airspace. Nevertheless, as a response to the event he announced that Turkey changed its rules of engagement, and said it would start to consider all "military elements" approaching from Syria an enemy threat and would act accordingly. Subsequently Turkey shot down a Syrian Mi-17 helicopter in September 2013 and a MiG-23 warplane in March 2014. In early October, Turkey and NATO protested against what they saw as Russia's deliberate violations of Turkish airspace. [lower-alpha 1] The Russian Defence Ministry admitted that a Russian Su-30 aircraft had entered Turkish airspace "for a few seconds" because of bad weather, adding that measures had been taken to prevent a repeat of such incidents, however Turkish radar had tracked the aircraft straying into Turkish airspace for up to 5 miles lasting "several minutes". From 3–15 October, five discussions between senior ranking officials from Turkey and Russia occurred, concerning Turkish rules of engagement and Russian violations of Turkish airspace. On 6 November 2015, six U.S. Air Force F-15C fighters were deployed by US European Command from the 48th Fighter Wing at their Lakenheath base in Britain to Incirlik Air Base as part of Operation Inherent Resolve. The Government of Turkey requested these to secure the sovereignty of Turkish airspace because of earlier repeated Russian intrusions into Turkish airspace. On 19 November, Russian Ambassador to Turkey Andrei Karlov and the Russian military attaché Colonel Andrei Victorovich Dovger were summoned by Turkey. Russia, which was criticised by Turkey for having conducted operations near the Turkish border, a region inhabited by Syrian Turkmen and largely free of ISIL (though al-Nusra Front, the al-Qaeda affiliate in Syria, is present in the region), was notified that Turkey's rules of engagement were in place and it would react to any violations of its border security. Turkey also warned Russia that it would not be indifferent to "attacks targeting the life security of Turkmen" in the Bayırbucak area. The preceding week Turkey had called for the UN Security Council to discuss attacks against Turkish-backed Turkmens. Approximately 1,700 people had fled the area in the previous three days due to battles between Syrian government forces and anti-government Syrian Turkmen and al-Nusra Front fighters. Russia has bombed the area near the Turkish border to support Syrian government forces. Syrian Turkmen formed their own armed brigades named Syrian Turkmen Brigades in opposition to the Syrian government of President Bashar al-Assad, loosely affiliated with other rebels such as the Free Syrian Army. The Turkmen brigades also cooperate with al-Qaeda's Syrian affiliate the al-Nusra Front and with the Salafi coalition known as Ahrar al-Sham. In Latakia the Turkish-supported rebels formed the Jabal al-Turkman Brigade. On 24 November 2015 at 9:24 am, as it was returning to Khmeimim airbase, a Russian Sukhoi Su-24 bomber aircraft with tail number 83 was shot down near the Syrian–Turkish border by a AIM-9X Sidewinder missile from a patrolling Turkish Air Force F-16 fighter jet. The Economist reported that the two Su-24s were on their way to strike Syrian Turkmen targets. Syrian government forces supported by the Shiite militias and the Russian air force were fighting against Syrian Turkmen brigades, Army of Conquest and al-Nusra Front fighters. Early reports from Russian news agencies citing the Russian Defence Ministry, indicated that the aircraft had been downed by a ground-based strike from Syrian Turkmen rebels, but they later confirmed Turkish reports that the aircraft had been shot down by Turkish fighter jets. The Turkish military released a graphic of the Russian aircraft's flight pattern, which shows it crossing the southern tip of Hatay Province before being shot down and crashing near Turkmen Mountain. Russia then countered Turkey's radar trace analysis by publishing a different flight map showing no airspace violation. Three days later, on November 27, Russia published another map. According to the Russian Defence Ministry, the Su-24 was downed from an altitude of 6,000 metres (20,000 ft) within one kilometre of the Turkish border and in Syrian airspace, while returning to the Khmeimim airbase in Syria. Russia has maintained that the aircraft never left Syrian territory. The Russian Defence Ministry confirmed the aircraft was an Su-24 but said that it had proof the jet was within Syrian airspace. According to the commander-in-chief of the Russian Aerospace Forces, Viktor Bondarev, a Turkish F-16 entered Syria's airspace for 40 seconds and flew 2 km (1.2 mi) inside Syrian territory, but the Russian bomber did not violate the Turkish border. The pilot of the Su-24, Oleg Peshkov, 45, was posthumously awarded the Hero of the Russian Federation, the country's highest military honour; the surviving weapon systems officer, Konstantin Murakhtin, and the killed rescuer, Alexander Pozynych, received the Order of Courage. On 2 December Peshkov was buried with full military honours in the Alley of Heroes of the cemetery in Lipetsk with about 10,000 people attending. The Turkish state-owned Anadolu Agency showed the initial video footage of the aircraft crashing and the two pilots parachuting down. Russian helicopters conducted low-altitude combat search and rescue flights in the area to look for the pilot. Two Mil Mi-8 helicopters were sent to find and recover the pilots from the crash site. One of the helicopters was damaged by small-arms fire from Syrian Turkmen Brigade militants, resulting in the death of a naval infantryman, and was forced to make an emergency landing. All the surviving crew of the helicopter were rescued and evacuated later on. The Free Syrian Army's 1st Coastal Division claimed that they subsequently destroyed the abandoned helicopter using a US-made BGM-71 TOW missile. As the Russian armed forces began planning an operation to extract the Su-24 pilot, Iranian General Qasem Soleimani contacted them and proposed that a special task force unit be formed of Hezbollah's special forces and Syrian commandos who had been trained by Iran and were familiar with the geography of the region to be tasked with the ground operations for the pilot's rescue, with Russia providing transport, logistical support, air cover and satellite intelligence. The team of 26 special forces commandos which General Soleimani put forth consisted of eight Hezbollah special forces personnel and 18 Syrian special forces commandos. One of the pilots had been wounded and then killed by "jihadists" after parachuting on the ground, while the other one escaped and rescued, and handed over to Syrian Army. The body of the dead pilot was flown to Turkey and Russian officials in Ankara arranged for its repatriation to Moscow. On 25 November, the foreign ministers of Russia and Turkey spoke for an hour by telephone, and both governments stated that day that they would not initiate a war as a result of the incident. Russian Foreign Minister Sergey Lavrov told journalists that his country would "seriously reevaluate" its relationship with Turkey. The Russian Defence Ministry broke off military contacts with the Turkish Armed Forces and Russian defence officials said that future airstrikes in Syria would be escorted by fighters. According to the Russian Minister of Defence Sergey Shoygu, Russia will deploy S-400 surface-to-air missile systems to Khmeimim airbase in Syria, where the Russian Aerospace Forces group is stationed. On 2 December it was reported that Turkey had countered by installing the KORAL electronic jamming system along its southern border with Syria. On 25 November – the day after the jet was shot down, a Russian law-maker, Sergei Mironov, introduced a bill to the Russian parliament that would criminalize the denial of the Armenian Genocide, a political move that Turkey has strongly opposed when countries like France and Greece adopted similar laws. On 27 December, the Turkish newspaper Hurriyet published an interview with Alparslan Çelik who spoke about the downing. TASS reported that the Turkish militant had fought in Syria for two years. The Russian foreign ministry expressed surprise and indignation that a major Turkish newspaper had given floor to the “murderer and terrorist... filled with hatred towards Russia and the Russian people.” On 30 December, the Russian foreign ministry called for Ankara to arrest Çelik. NATO: Secretary General of NATO Jens Stoltenberg backed Turkey's assessment of the engagement offered solidarity with Turkey, and called for both sides to de-escalate the situation. Czech Republic: President Miloš Zeman said Turkey’s attack on the jet again fuels previously-raised suspicions that Ankara is supporting the terrorists in Syria. Prime Minister Bohuslav Sobotka and Foreign Minister Lubomír Zaorálek called for better co-ordination among those fighting in the region. Iraq: Vice President Nouri al-Maliki accused Turkey of hypocrisy, saying that "Turkey’s planes violate Iraqi and Syrian airspace every day". Israel: Israeli Defence Minister Moshe Ya'alon said that Russia notifies Israel when its forces in Syria are planning operations near the Syrian-Israeli border. He also stated that an incident where a Russian aircraft crossed into Israeli territory had been quickly resolved through direct communications. ↑ On 15 October, Turkish jets shot down a drone operating in Turkish airspace. United States defence officials said that the drone was Russian; Russian officials denied that any of their aircraft had been shot down. On 17 October, Turkish Prime Minister Ahmet Davutoğlu said Turkey would shoot down any aircraft violating its airspace. ↑ Phil Stewart, Russia didn't give downed jet's flight plan to U.S.: U.S. officials, Reuters (27 November 2015). Wikimedia Commons has media related to Sukhoi Su-24M White 83. This page was last modified on 31 May 2016, at 16:38.